STORM is the contrived acronym for an EU programme designed to assess the impact of climate change on archaeological sites. The full title is Safeguarding Cultural Heritage through Technical and Organisational Resources Management. As you can see, some words had to be shoehorned into the title and others were omitted but the end result is a simple and memorable name for a complex research project. Bob Humphrey-Taylor, the chairman of Mellor Archaeological Trust came to explain the reality behind the name. As a matter of policy the EU tries to take an integrated approach. Historic and archaeological assets both encourage and depend upon tourism so protection is important. However, as sites are made more accessible, there is inevitably more damage and therefore more need for protection. Another sort of damage is natural - the damage caused by the weather (short term) or climate (long term.) It is this that the STORM project is concentrating upon. Ephesus is a World Heritage site dating back to the 10th century BC. The Baths of Diocletian were built in 300 AD as public baths for the people of Rome but over the centuries they have been greatly modified by building both a basilica and a monastery within its footprint as well as more recent constructions. Rethymno originated in Minoan times but is mainly known for its Old Town built by the Venetians between the 13th and 16th centuries. Tróia is the site of a settlement from Roman times involved in fishing and salt production. All three of the sites for which Mellor Archaeological Trust is responsible are included in the research - the Bronze Age burial ground at Shaw Cairn, the Iron Age to medieval fortified encampment at the Old Vicarage and the newly excavated Mellor. These sites range in size, in age, in geographic location and, above all, in the nature of the long term threats to their fabric. As such they present a wide range of problems and conditions. Air pollution, flooding, earthquakes, vegetation growth, too much rain, too much sun. (Mellor does not have the latter problem). Problems such as these are present on almost all archaeological sites and the work carried out on these five sites in measuring, testing and researching will be of use to all of them. Not just the current threats but also the longer term threats of climate change and increased human activity whether incidental such as traffic pollution or planned such as tourism. During the three years of the project a wide range of sensors, gauges and surveys are being employed at all the sites by the various universities and research institutions associated with the project. The Mellor site is working closely with the University of Salford and Historic England but many other partners are also involved. In time various schemes tailored for the individual site will be recommended but in almost every case these will be reversible if they are found to be ineffective or possibly even harmful. The results of all these trials will be widely demonstrated to the involved stakeholders and the relevant authorities. As a result they are expected to lead to new, more efficient governmental processes for the protection of the sites against climate changes and natural hazards. The particular areas of concern at Mellor relate to extremes of wetting and drying, the slippage of embankments and the long term conservation of brick and stone structures. For example, are they best preserved in the open or should they be buried for protection? The project is designed to last three years, ending in May 2019 but all of the sites will carry on with their measurement and research as far as possible and try to spread the knowledge gained to other sites with similar problems. Brexit or no Brexit, we can still cooperate and share our knowledge. Because of continuous exposure of the monuments to extreme climate events and natural hazards, the old city buildings and the Fortezza fortress suffer from several types of deterioration. Results can be spotted on both stones, binders, mortars and coatings of the monuments, creating the need for their rehabilitation and preservation. Although the restoration and conservation work carried out by the involved stakeholders is significant, the current protection and conservation actions lack the real-time monitoring and risk assessment, which is required for more effective and efficient management. Ancient city of Ephesus was originally constructed as a harbour city. The city was partially destroyed by an earthquake in 614 AD. The city’s importance as a commercial centre declined as the harbour was slowly silted up by the Kaistros river. In the past the city was exposed to inundation, and erosion. It is under continuous exposure to human made and natural hazards. The structures need to be strengthened against seismic hazard. In the context of STORM, a seismic hazard assessment for the site is performed. A detailed numerical 3D solid model of the structure is generated using 3D laser point clouds provided from radar measurements. Structural performance of the structure are assessed to detect possible weaknesses or damage initiation location. The structural model accounts for the effects of climate change, temperature, humidity and human related hazards. Material and geometric properties of the construction elements will be changed to account for such effects, which possibly caused degradation of materials or loss of construction elements due to environmental or human related hazards, in time. Innovative, applicable and reversible retrofit schemes will be suggested to prevent further (progressive) damage and to improve the seismic performance of structure in future. The major causes of degradation in the Roman site of Tróia are related to its geographical location: the shoreline of the River Sado estuary, in the vicinity of the Atlantic Ocean. The proximity to the estuary and Ocean cause a variety of threats: tidal action, mechanically affecting constructions on the shore, high humidity, favouring biological and carrying soluble salt that damage building materials in general and painted stucco in particular, rising humidity, strong winds and rain causing mechanical damage, and high thermos-hygrometric variations. Vegetation growing and wasps making nests on earthen mortars also affect the integrity of ancient structures. The sand substrate and sand dunes, easily moved by water and wind, pressure archaeological structures and accelerate erosion, which is clearly manifested as structural deformation, masonry open joints and loss of cohesion of bedding mortars. Ann Hearle leads a party round the Mellor Mill Archaeological site. Steam Power came comparatively late to Mellor Mill, in comparison with a majority of large cotton mills. Quarry Bank Mill built in 1784, had Boulton & Watt steam engines in 1810, however the nearby Torr Vale Mill had itself survived until 1856, when being re-built, without a steam engine. In 1860 two steam engines and boilers were installed by Benjamin Goodfellow, well-known Hyde engineer. Goodfellow supplied the engines to power the London sewage system in 1895, replacing those of James Watt & Co.
Boilers and engines were enclosed in a new building at the northern end of the main mill building. The installation of the event was of such note that, following a successful trial run of the system, the company saw fit to have an evening celebration dinner at the Navigation Inn. Wide Angle view looking from the Steam Engine house area. 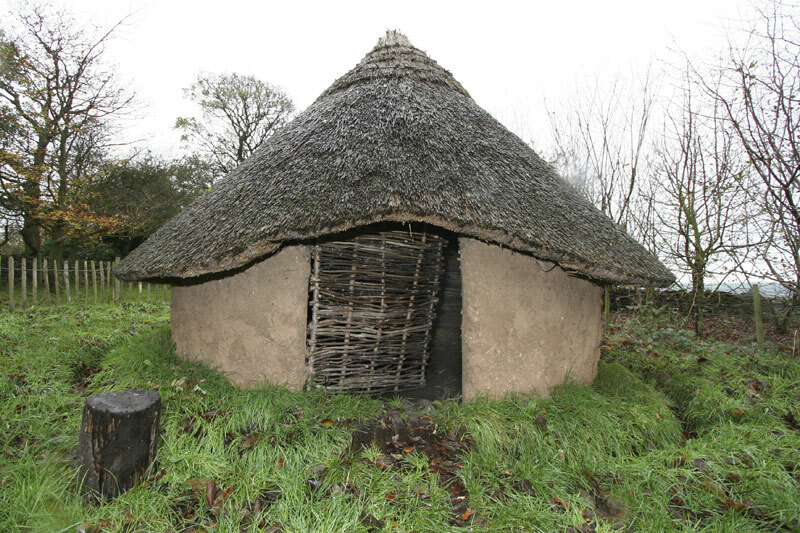 In 2002, students from the Ridge Danyers Sixth Form College were involved in a European Community Culture Programme, The Mnesonyme Project, to reconstruct an Iron Age Roundhouse on the site, which remains in place, providing an evocative reminder of how the area might have looked during this period. Read an overview of Mellor within the Region in the 2001 Report.